Romancing SaGa 2 :: Romancing SaGa 2 is out today! Romancing SaGa 2 is out today! Romancing SaGa 2 is out today on Steam! To celebrate the occasion here’s a short Q&A interview I ran with Akitoshi Kawazu (director of the original Romancing SaGa 2) and Masanori Ichikawa (producer of this version of the game). Whether or not you’ve played a SaGa game before I recommend having a read - as you’ll soon find out, this is the perfect time to jump into the series! 1. As this is the second Romancing SaGa game, do players need to play the first Romancing SaGa in order to enjoy this one? AK: No problem at all. The three Romancing SaGa games are all completely different games with really nothing connecting them at all! So if you haven’t played the first Romancing SaGa then you have nothing to fear, dive right in to the second! 2. For anyone playing the SaGa series for the first time, what can you tell them about it? AK: Square Enix are the makers of RPGs like FINAL FANTASY, DRAGON QUEST and KINGDOM HEARTS, but the SaGa series has been there from the start. It’s something want to push so we’re remaking it now and releasing it for the Western players out there so we really hope you can try it and that you can enjoy playing it as it has been around for a long time. 3. Why have you decided to remaster Romancing SaGa 2 out of all of the titles in the series? AK: Well that’s actually because the first Romancing SaGa has already been remade as Romancing SaGa Minstrel Song so naturally we went for the second Romancing SaGa game, it’s very popular in the Japanese market and we had no problem deciding that. 4. What has changed in the remaster compared to the original game? MI: In the system itself there are a few differences, we have included auto-save, and there is some new end-game content as well, as well as some additional content like an additional dungeon you can play. The additional content is not essential to playing the game, you can select an option to play the game without this extra content included so you can play the Romancing SaGa 2 scenario how it was released way back when! 5. You’ve been working to create RPGs for such a long time, how has your approach to creating games changed in that time, if at all? AK: I’ve been making games now for 30 years, so you could say my experience points have gone through the roof! I like to think I am getting better at how I make my games but I’m aware that I’m also getting older, so I need to make sure I’m not losing my touch in that sense. 6. You have been involved in the creation of so many classic games, which one is your favourite? MI: A lot of other fans are going to be upset when you say that! You’ve got Unlimited SaGa fans, fans from lots of other games out there. But really, any game we’ve made, we love them all! 7. What would you like to say to players trying out Romancing SaGa 2 for the first time? AK: What can we say to these guys? It’s a very tough game, a very difficult game! So be aware of that when you start playing! (laughs). 8. Do you have a message for all fans of the SaGa series? AK: Why don’t we leave the message to the fans to Ichikawa-san? MI: Thank you very much for waiting this amount of time! If possible, we really want to keep pushing out more of these so we hope you’re all on our side and supporting us with this, and look forward to more to come! AK: We will be putting out more so get your hopes up!! If you’re a fan of old-school JRPGs with turn-based battles then Romancing SaGa 2 is honestly the perfect game for you, especially if you like a challenge. 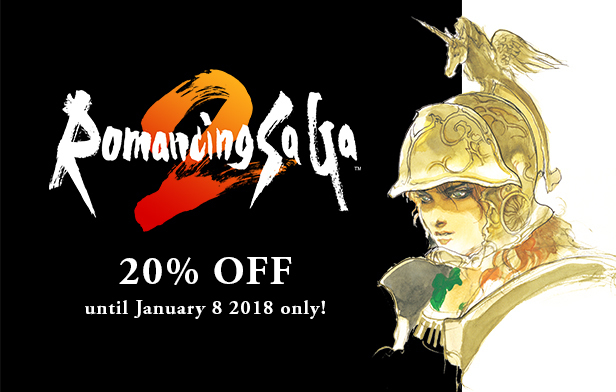 As Kawazu-san said, you don’t need to have played the original Romancing SaGa to enjoy this one, and it’s a great time to get into the series, especially as Romancing SaGa 2 is 20% off until January 8th! Bought it despite the launch issues. Been wanting to play this since reading about the series in the early 90s, and I have a ton of love for Kawazu's unconventional game design. I'd really like to see more of these come over! 아니 다시 생각해봐도 열받네. 한글화라도 해서 낼거 아니면 그냥 지역락 풀어줘요. 간만에 하고싶네. Where the STEAM front page post ? Thanks for the game, SE, But, one recommendation. Could you please take all of the icons off of the screen? Or at least give us the option. So, another great Square game, but technically a piece of♥♥♥♥♥♥ GW SquarEnix. Man :( I would have totally bought this but all the user ratings are so negative. What happened! The worst porting in history. SquareEnix still considers PC users as stupid consumers. Pas de VF alors qu'il y a des traductions non officiel du jeux fait par des amateurs, c'est quand même un peu n'importe quoi de la part d'une boite pro.